Discover the pleasure of playing cards with My first card game, to play alone or with family to a multitude of different games (contains 5 rules of play). 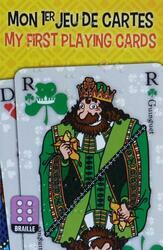 My first card game is designed especially for young children: adapted graphics, 4 colors of different cards, to better distinguish them (black for the spades, red for the heart, green for the clover and blue for the tile), the axes and swords traditionally in the hands of kings and valets are replaced by fruits and toys. The names of the figure cards are inspired by characters from the famous fairy tales of Perrault, Grimm, Andersen and Madame Leprince de Beaumont. To switch from the French version to the English version, simply return the cards to reveal the letters: V - j (Valet - Jack), D - Q (Lady - Queen) and R - K (King - King) ). The "Braille" process is not traditional embossing, but an alternative solution using a transparent reflective ink. The blind who tested this technique found it quite relevant.